It’s not just about the spinning, there are a number of stages involved in creating yarn. Let’s assume we’ve selected and prepared our fibre, which in itself is a whole other set of processes. When I started spinning I took advantage of the fabulous selection of fibres sold by Wingham Wool Work  and worked from there. 1. Spinning the singles. I didn’t know much about the making of yarn when I started. But my years as a knitter taught me that yarn was usually plied from several thinner strands. What I learnt from my early drop spindle experiments, and from resources provided by the marvellous Abby Franquemont , was that you spin the fibres in one direction – let’s say clockwise – and then ply two or more of these “singles” together by spinning them in the other direction – anticlockwise. So spinning the singles involves starting from the prepared fibre, drafting it out into the desired thickness whilst adding the twist that will hold the fibres together. 2. Plying. 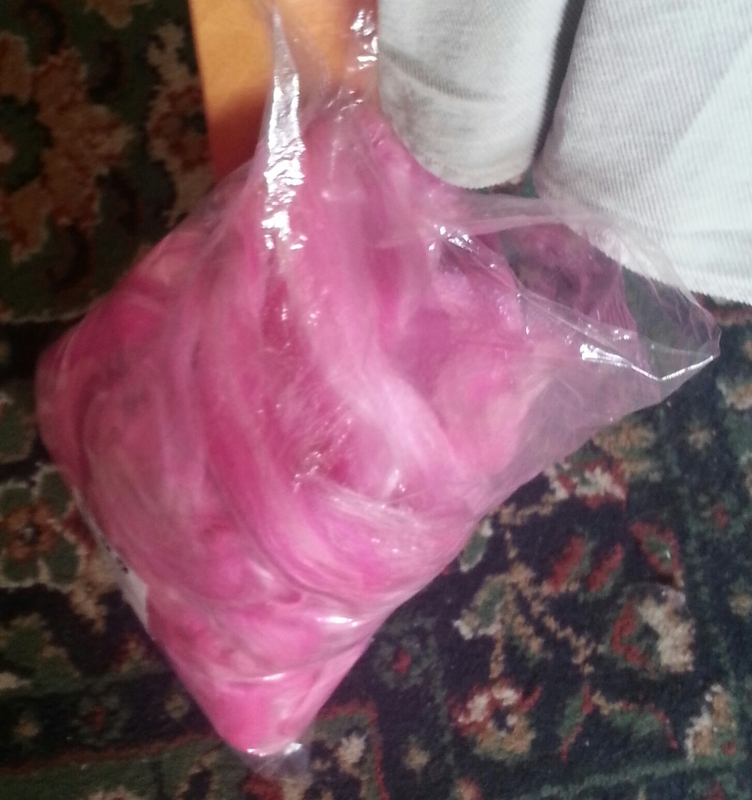 Now, if you stop at that point it’s likely you’ll end up with yarn that resembles silly string! The singles contain active twist. They want to coil up on themselves. They’re like a taut spring, full of potential energy. It is certainly possible to make useable yarn from singles, but the thinner they are, the more twist is needed to hold the fibres together, and the more likely you’ll have silly-string yarn unless you ply it. Plying in the opposite direction to that in which the singles were spun balance the twist, so that the yarn no longer wants to coil back up on itself. 3. Skeining. 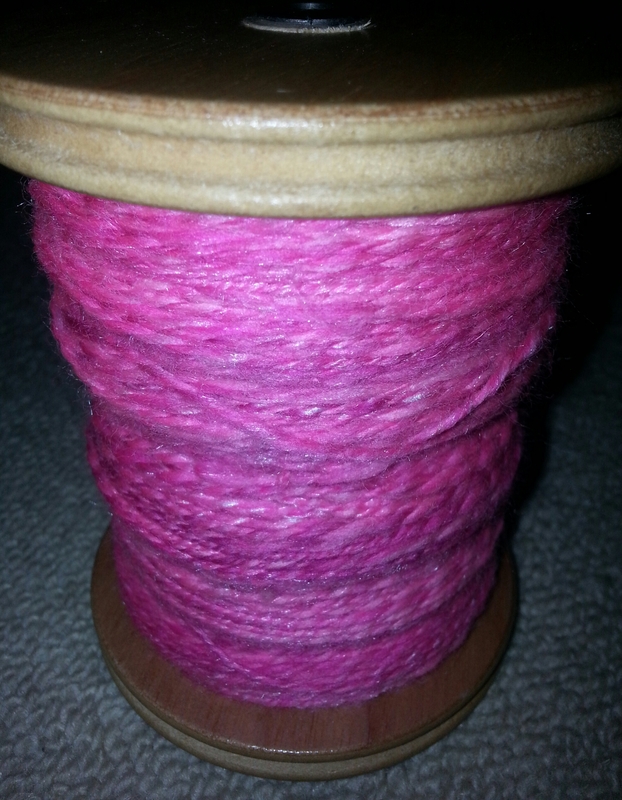 You now have a bobbin full of plied yarn. To turn it into a skein you use a niddy noddy (the most amusingly named tool in my collection.) Cleverly, you can measure (or look up the manufacturer’s information) the length of one complete wrap on the niddy noddy. My Ashford niddy noddy is 5′ or 60″ per wrap. So, count the wraps, multiply by the length per wrap and Ta Da!! you have the yardage and/or meterage of your skein. 4. Washing. At this stage we really want to turn these plied singles into yarn, so we set the twist. The advice I follow here comes from Jennifer Beamer of Expertly Dyed: Art by Science , who publishes excellent blogs and vlogs about yarn-making. To set the twist I like to wash the skein and then soak it in water with a little conditioner, just to pamper the fibres a little bit after all those times they’ve run through my fingers and the flyer on my wheel. 5. Fulling. Fulling is a process of ever so slightly felting the fibres so that the yarn becomes a unified structure. Taking the yarn out of its final rinse I squeeze excess water out, but leave it fairly wet and then it’s time to be a little rough with it. I tend to beat the skein against the side of the bathtub, moving the skein through my hands after each strike. Sounds weird, looks odd, works out great. 6. Hanging. finally I hang my skein to dry, and if my plying hasn’t quite managed to balance the twist – you can see this because any residual active twist means the skein doesn’t quite hang straight – then I hang a little weight from the bottom of the skein, to stretch it out as it dries and finish with a beautiful, soft, balanced yarn. Composition – what fibres are included, and the percentage of each. Weight, or WPI – WPI stands for wraps per inch and tells you if your yarn is aran, dk, ‘4ply’, etc. Meterage – essential for planning your project! Care instructions – hand wash? machine wash? dry flat? What you see on the left is a skein that I spun for my mum’s birthday in the April of 2013. 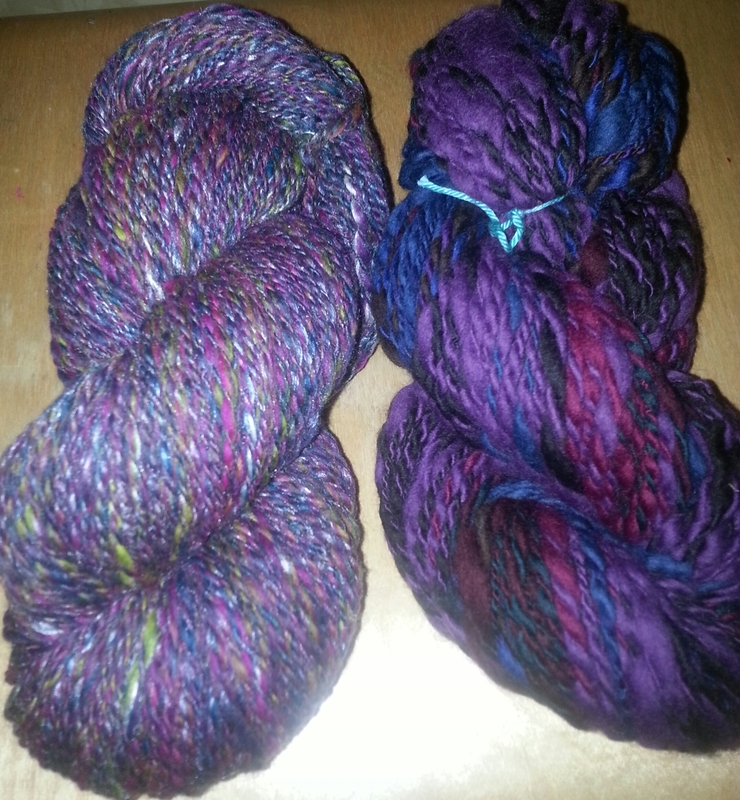 What you see on the right is the first ever skein I managed to spin on my wheel in January 2013. So, 4 months of improvement in one picture. It wasn’t an arduous task, I didn’t have to work hard at it. I just kept spinning and learning and spinning some more. 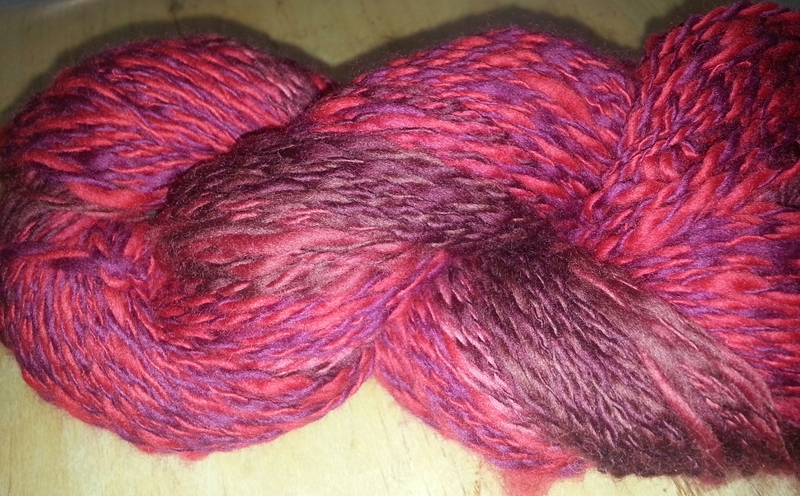 When I’d finished my very first skein, I was utterly thrilled. Not because I’d made beautiful yarn – I thought it was a bit of an ugly duckling. It was the pure joy of knowing that I had made something from scratch, just with my own hands and my own tools. It wasn’t beautiful yarn, it wasn’t anything I would have chosen and bought, but it was my yarn that I’d made myself. 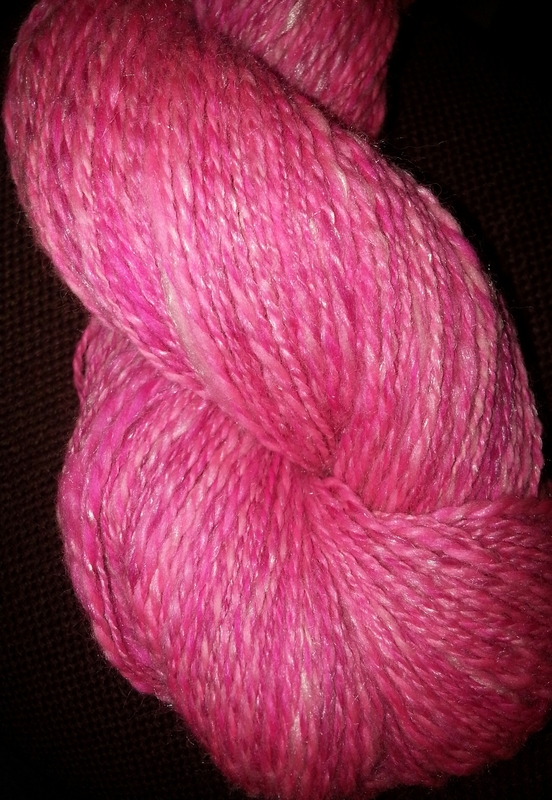 I stashed it away and moved onto the next spinning project. 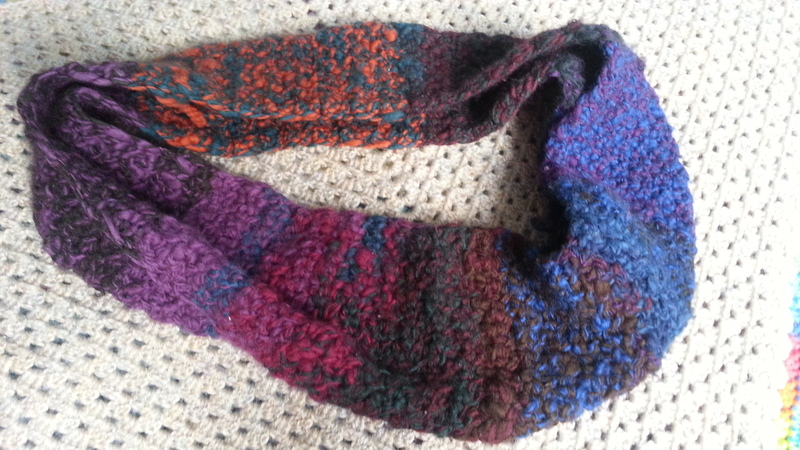 But eventually it came out of the drawer and became an infinity cowl. 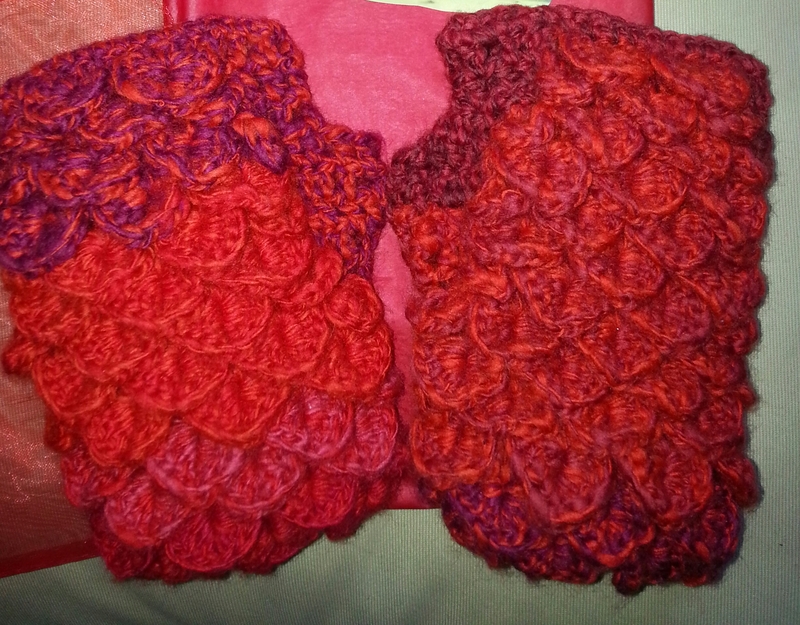 I chose a project to suit the yarn – alternating double and treble crochet stitches to create a bumpy fabric. And now I have my own pure handspun merino cowl to keep me warm, and remind me of my very first adventures at the spinning wheel. In the beginning was the yarn. Yarn has always been a part of my life, though during my childhood we called it “wool”. As I’ve started to work with a wide variety of fibres, “yarn” has become a more useful term. 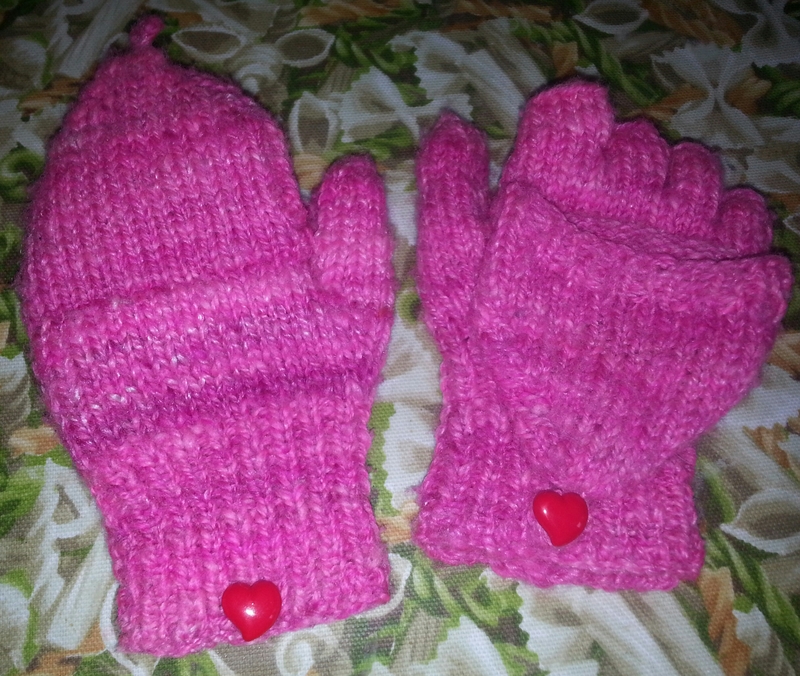 As a small child it was for knitting, and that hobby sustained me for many years. In 2010 I decided to learn to crochet. I had tried to crochet a few times before, always ending in failure. I found it so different to knitting. I didn’t really understand how it could make the shapes I wanted. But this time was different. I took a massive step forward. I decided that this time I would allow myself to fail. Instead of failure being a disappointing end result, it became a vital part of the learning process. I’d tried to crochet before, so I knew how it was going to go. I knew I wouldn’t get it straight away. But I decided that this time I would try and then fail, and through that experience I’d learn something to take with me into the next attempt. Frustration was transformed into joy. I hooked and frogged a few things (and ‘things’ is honestly the most descriptive word I have for them!) until at last, my first success! A granny square. OK, it had 5 sides, but at least it was recognisable. I frogged my 5-sided granny square and started again. This time on a fan stitch square. And this time, it worked! I still have that square. 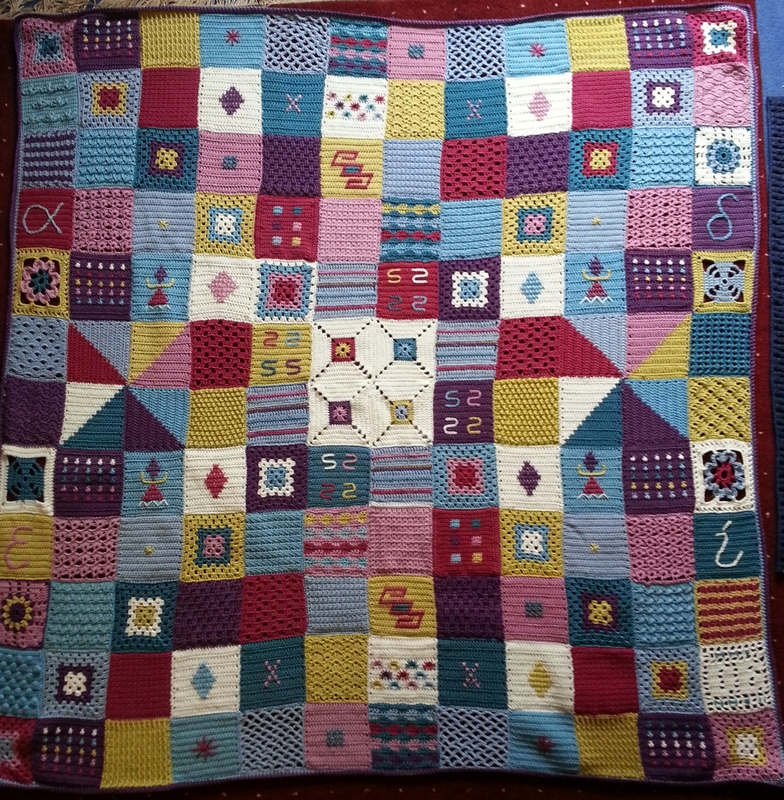 It’s part of my patchwork sampler blanket, worked over two years and a visual record of my learning journey. I can see it and point to it and touch it today. A concrete memory. One day a very good friend showed me the drop spindle kit she was considering. It suddenly occurred that I’d like to try that too. And a passion was born. I started on the drop spindle, which is a lovely way to learn, and right at the end of 2012 I was gifted my spinning wheel; the very aptly named Ashford “Joy”. I took my learning process into my spinning work. Of course, it didn’t go smoothly. I no longer expected it to. No experience was wasted, it all added to my knowledge. By early 2013 I was producing my own yarn. Sure, at first it was lumpy and bumpy. I wasn’t spinning it for a knitting or crochet projet. I was spinning it to learn how to spin. I squirrelled each skein away and sooner or later a project would emerge, for which my thick ‘n’ thin, quirky old yarn was just perfect. It’s not about producing a flawless product. It’s about matching the project with the yarn. It’s not about never making a mistake. It’s about learning what you can from every experience. It’s not about mindless, mechanical production. It’s about the joy of the creative process.